Welcome to GoodFixer ! We are a professional manufacturer who specialize in Electronic accessories. Premium quality products, excellent customer service, that's what we provides to you. This battery only for Apple iPad 3/4. Compatible Model: Only can use for Apple iPad 3 / iPad 4 (A1416,A1430,A1403,A1458,A1459,A1460),support all versions for iPad 3/4. Grade A+ 3.7V 11560 mAh 43Whr Lithium polymer battery cells ,ensure longer battery life and Brand new 0 Cycle, refuse refurbished. 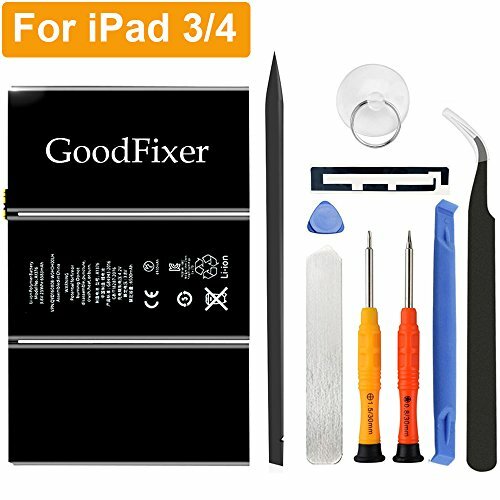 Package include: 1* GoodFixer battery for iPad 3/4 + a set of repair tools + 1* adhesive strips. If you have any questions about this product by GoodFixer, contact us by completing and submitting the form below. If you are looking for a specif part number, please include it with your message.